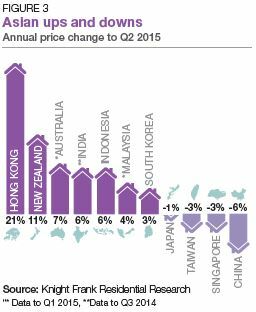 Global house prices shifted marginally in the year to June 2015 rising by only 0.1%. Lingering concerns over the Eurozone economy, jitters in global stock markets and discussions of when, not if, a US rate rise occurs is impinging on growth. As China supplants Greece as the world’s key economic concern, and emerging markets look increasingly anaemic, there is a global quest for growth which is evident at a macroeconomic level but also when analysing house price performance. In annual terms the Global House Price Index rose by only 0.1% in the year to June, its weakest rate of growth since the final quarter of 2011. Of the 56 housing markets tracked, 27% recorded an annual decline in prices but back in 2011 44% of housing markets fell into this bracket. Despite stringent cooling measures, Hong Kong (up 20.7%) and China (down 5.7%) find themselves at opposite ends of the annual rankings. Increasing liquidity and the flow of wealthy mainland Chinese investors into Hong Kong’s residential sector meant the number of new homes sold in the first half of 2015 exceeded 8,700. The recent volatility in the Chinese stock market has underlined the fragility of the Eurozone’s recovery and has pushed the likelihood of a rate rise by the US Federal Reserve further back – good news for homeowners in the US (and beyond) but bad news for corporate balance sheets. 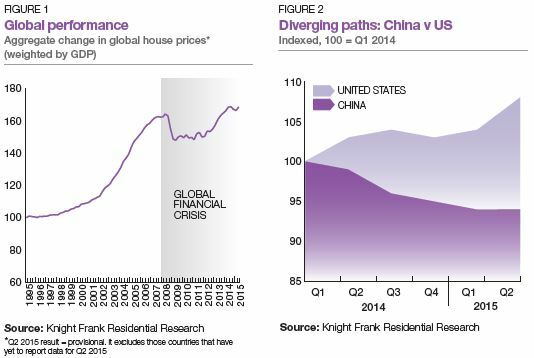 Housing markets in China and the US, two countries which together account for around 33% of global GDP, are following divergent paths. Since the start of 2014 mainstream prices in China have fallen on average by 6.2% while the average price of a residential property in the US is up 7.6% over the same period (figure 2). In Dubai, mainstream residential prices fell by 2.8% quarter-on-quarter and declined by 12.2% in the year to June. Weaker demand, a strong US dollar and ongoing cooling measures have dampened sales volumes in the mainstream sector. 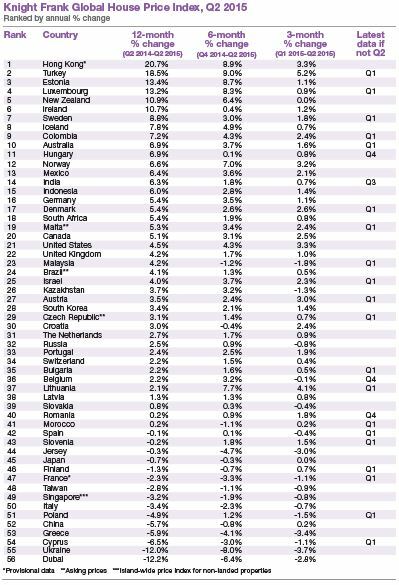 Europe is no longer the weakest-performing world region, a title it has held for 15 consecutive quarters. On average prices across Europe increased by 2.8% year-on-year with Turkey, Estonia, Luxembourg and Ireland all achieving double-digit annual price growth. The Knight Frank Global House Price Index established in 2006 allows investors and developers to monitor and compare the performance of mainstream residential markets around the world. The index is compiled on a quarterly basis using official government statistics or central bank data where available. The index’s overall performance is weighted by GDP and the latest quarter’s data is provisional pending the release of all the countries’ results. © Knight Frank LLP 2015 – This report is published for general information only and not to be relied upon in any way. Although high standards have been used in the preparation of the information, analysis, views and projections presented in this report, no responsibility or liability whatsoever can be accepted by Knight Frank LLP for any loss or damage resultant from any use of, reliance on or reference to the contents of this document. As a general report, this material does not necessarily represent the view of Knight Frank LLP in relation to particular properties or projects. Reproduction of this report in whole or in part is not allowed without prior written approval of Knight Frank LLP to the form and content within which it appears. Knight Frank LLP is a limited liability partnership registered in England with registered number OC305934. Our registered office is 55 Baker Street, London, W1U 8AN, where you may look at a list of members’ names.